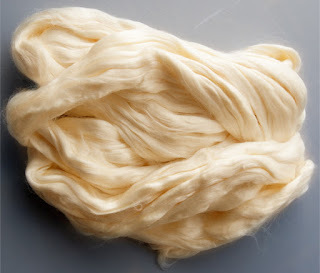 Soysilk is made from soyabeans, a completely natural and renewable resource. It is naturally anti bacterial and anti fungal because of its excellent water transmitting properties as it wicks away moisture from your skin. Soysilk feels wonderfully soft, silky and drapey, Soysilk is great to blend in yarns, art batts and to work into your nuno felting projects. Insulating enough to provide warmth and resists shrinkage and wrinkling.